The Republic of Ireland took to the field in their second group match at World Cup 1994 with exactly the same team that had beaten Italy six days earlier in New Jersey. The opponents were Mexico and the venue was the Citrus Bowl in Orlando, Florida. The midday match was marked by soaring and scorching temperatures on the pitch as well as a major flare-up on the sidelines. The Irish were buoyed by their inspired victory over the Italians and the Mexican team were under pressure to get a result following their 1-0 loss to Norway in their opening match. In the course to the 90 minutes of the match in the Citrus Bowl went from last place in the Group to top place in an extremely tight group. As had been predicted before the match an ageing Irish team struggled under the noon heat in Orlando. Age, heat and a skilful speedy Mexican team presented the Republic of Ireland with an insurmountable challenge. 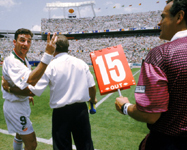 Goals by the talented Luis Garcia in either half defeated the Irish although a late goal from John Aldridge proved to be far more than a mere consolation. Aldridge had come on as a 67 minute substitute amid a welter of controversy. An overzealous FIFA intervened in the substitution process which caused much confusion an angst amongst the Irish management. For a couple of minutes Ireland played with ten men as Tommy Coyne had come off the pitch but the fourth official refused permission for Aldridge to enter the fray. This enraged Aldridge and Irish football team manager, Jack Charlton. The latter's involvement in the incident ultimately led to a touchline ban for the Englishman for the last group match against Norway at Giants Stadium in New Jersey. Charlton decided to make an immediate substitution after Garcia's second goal in an attempt to secure something from the game. Aldridge's introduction proved to be inspired despite all of the controversy surround it. With about seven minutes left in the match fellow substitute Jason McAteer latched on to a pass from John Sheridan. His accurate cross from the right of the Mexican box found Aldridge on the penalty spot. The Tranmere Rovers forward rose to power the ball past the despairing dive of Campos in the Mexican goal. Ultimately this goal proved to be decisive to Ireland's progress in the 1994 World Cup finals. As Niall Quinn, who was co-commentator on RTE Television with George Hamilton, said prophetically at the time "...that could prove to be one of the most important goals ever scored in defeat." Following the second round of matches in Group E all four teams had won one, lost one, and had identical goal differences. Mexico topped the group due to the number of goals scored and because of the victory over the Irish. Mexico: Jorge Campos, Claudio Suarez, Juan Ramirez Perales, Ignacio Ambriz (capt), Marcelino Bernal, Alberto Garcia Aspe, Joaquin Del Olmo, Carlos Hermosillo, Luis Garcia, Luis Alves ZAGUE, Jorge Rodriguez. Venue: Citrus Bowl, Orlando, Florida, Date: 24th June 1994 Attendance: 60,790 Referee: Kurt Röthlisberger from Switzerland.